I turned 22 yesterday, and in the past couple of weeks I've been reflecting on all of the amazing things I've done as a 21 year old. Some I imagined doing, but others were so incomprehensibly not-me I couldn't have even dreamed up. I went skiing, graduated from my degree, started working freelance, went to Tenerife, had my sister living with me all summer, and so many other things that I'm super proud of. 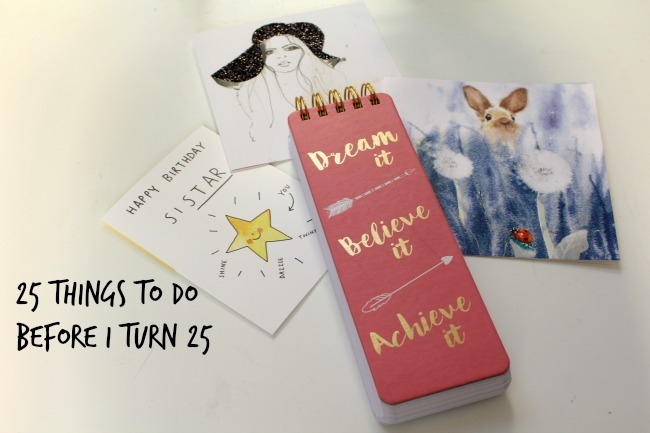 It's really made me think about what I want to achieve over the next couple of years, so here we are: my 25 things that I want to achieve before I turn 25. What would you have on your list? Posts like this are great and I find so helpful. I recently did one on my blog as I'm turning 30 next year and wanted to get down my "to do list" and then I can look back on it next year. I've already completed some of the things I set out to do which is incredible and it has made me more motivated than before do actually do it. I'm pretty excited to get cracking on my list too! This was such a great post lovely I hope you manage to do all the things you want to do! I recently posted something super similar to this for my 19th birthday, except that your's sounds do much more grown up than mine haha. (Adulting seems so scary honestly though.) But anyway, I love most that "learn to love myself" is an item on the list. It is so incredibly tough and important, and it's something I should have put on that list myself, because I definitely need to keep working on it too. Ooh and 4, 9, 17, and 22 are things I would love to accomplish as well! Adulting terrifies me still! I've just moved and I'm already getting started on 17! I'm so nervous about the idea of learning to drive (my spatial awareness is simply non-existent), but it's really something I need to do! Great list of goals! I definitely need to write something similar....although I'm 24 and scarily close to 25! This was a lovely post! These all sound like really good goals and I hope you manage to achieve all of them! Number 2 is definitely an important one for me too! Thank you! I really hope I get at least 3/4 of them completed!